Scrubbs Farm is a 300 acre mixed livestock and arable farm in an area of outstanding natural beauty, the downland area being named 'Appledown'. There is a single suckle beef herd and two small flocks of sheep. Crops include winter wheat and spring barley. The farm has two areas of ancient woodland, which are home to a diversity of wild life, including roe deer, whilst the banks host many wild flowers. New planting is also being undertaken. 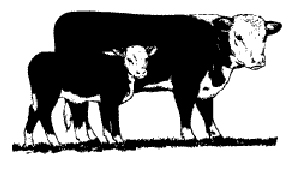 THE BEEF HERD - Our cows are Hereford or Angus crosses and most have a distinctive white face. They rear one calf each per season, the calves running with their dams until the autumn or following spring, when the arrival of the next calf naturally weans them. Beef is marketed locally through C. E. Evans & Son in, Alresford. THE SHEEP FLOCKS - The pedigree Suffolk flock is maintained to produce rams for the commercial flock and for sale to other flock owners. The commercial flock of mule and Suffolk cross mule ewes produces lambs for finishing and ewe lambs for sale. We have an In-House publication for sale - Appledown Animals: an introduction to the farm animals for children (£1.75 inc. p&p), please contact us to order your copy. Scrubbs Farm is currently being farmed by the third generation of the family, with the fourth generation growing fast. Over the coming years a wide variety of horse drawn farm equipment owned by the family will be restored to working condition for both display and use on the farm in demonstrations. Livestock equipment has evolved over the centuries and older tools have fallen out of use, but some items remain in current use. Items from bygone eras as well as tools still in use, together with more modern pieces, will be maintained and restored. Once the equipment has been restored the farm will open to the public on specified days.